I just finished my annual health retreat at Camp Colon. No, that’s not really the name of the resort, but that’s what I like to call it because it is sort of like a boot camp, but for your colon. Every year, I carve out a week and go on a fasting retreat. 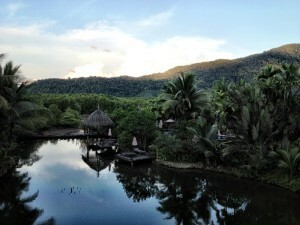 This year I am doing it at the Spa Resort in Koh Chang, Thailand. For seven loooong days, I don’t eat anything. My only sustenance is fiber drinks and herbal supplements, and for fun I willingly subject myself to 2 colonics a day. Wooohooo! All good questions. Let me start with the easiest first. Yes, I do get hungry but it is managed by the fiber drinks and herbal supplements. The mind and body are amazing resilient and quickly adapt under pressure. As for the colonics, they are necessary to help the detoxification process. Crudely put, you have no idea how much crap you have inside of you. So why do I do this? Well, for 358 days of the year, I live on a treadmill. My days are filled with work, deadlines, appointments and travel. My nights are filled restless sleep. In a word, I am “on” all the time. I am no different than from the millions of others, who, like me, live in the urban jungle. We are filled with stress, anxiety and live by the credo “if you aren’t moving forward than you are falling behind”. So for 7 days a year I stop. I stop living in my hermetically sealed air-conditioned world. I stop putting toxins in my body. I stop thinking about deadlines, obligations and where I have to be next. I stop trying to sleep and sleep. The break is transformational. I lose a little weight (not the objective but a nice by-product), get a nice tan, sleep 10 hours a day, dream in hi-def, and feel a lightness of being that I find hard to describe. I started these annual fasting retreats about nine years ago at the suggestion of a friend. Thailand has become (in)famous for these fasting (detox) retreats, because they are good and affordable – a lot like its healthcare. The Spa Resort in Koh Chang, where I stayed, is tucked peacefully away in a mangrove forest, serves locally grown organic produce and has a pool treated with sea salt instead of chlorine. If you have never swum in one, it’s a beautiful thing. During these fasting retreats, you trade old routines for new ones. Your days revolve around reading, massages, drinking fiber shakes and what’s coming out of your body rather than what you are putting in it. Here you meet the oddest collection of people from all over the world, and everyone is here for the same reason – they want to reconnect with their bodies and regain peace of mind. The seven days are a process, and each day is filled with ‘a moment’. Days 1-2 are the killer. Day 1 is a fight between my smooth talking mind and my fragile will. My mind is constantly trying to figure a way to talk my body into leaving. Day 2 is worse. Physical lethargy is compounded by headaches, a thick coat of white film on my tongue and the mother of all morning breath. Day 3 is the transition day. I wake up feeling clear headed. The sluggishness is gone, my nose and throat are free of mucus, and my breathing is calm and relaxed. Most importantly, the pangs of hunger are gone and I am sleeping like a baby. Day 4 I feel light…and I am. I’ve lost a couple of kilos and my body feels fit and strong. The restlessness and boredom that would normally force me to pull out my iPhone is replaced by calm. Instead, I sit and watch ants go about their chores. Day 5 and 6 I feel like Bradley Cooper in the movie Limitless. Anything is possible, but I don’t need to take a pill to get there. I start thinking how long I can hold onto this feeling. Four days ago my mind was screaming at me to “EAT” and now it is asking, “what’s the rush”. Day 7 I break the fast and it’s bittersweet. I feel great, but eating feels like cheating. I don’t want to put anything in my body that will change the way I feel. I now have to leave the cocoon and re-enter the concrete jungle that I call reality. Why am I writing about this? In large part because I think we live in a sick world and so much of the conversation in healthcare is about sick care and not health care. I work in hospitals and as much as I love the job I have no interest EVER in being a patient. This is just my way of taking responsibility for my health. Fasting retreats are not for everyone and I’m sure there are easier ways to ‘reset’ your body and mind than doing a Tom Hanks in Castaway, but nothing beats the feeling of getting back your six-pack than drinking one.